The Asscher cut was first cut in 1902 by Joseph Asscher for the Asscher Diamond Company. This was the first patented diamond cut, since then there have been many patents for diamond cuts. 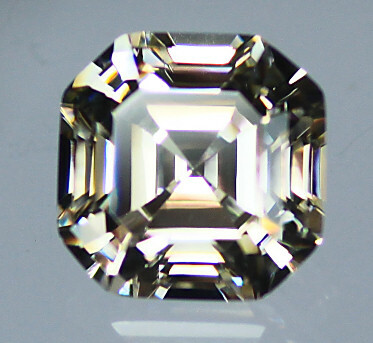 The Asscher cut has 58 facets and it's patent expired during the second world war. The Asscher Diamond Company has since restarted as The Royal Asscher Diamond Company and has redesigned the Asscher cut with 74 facets and patented it as the Royal Asscher Cut. This CZ stone is the original Asscher Cut with 58 facets. When buying light champagne material we will always choose the lightest colour available for our light champagne gems, the colour can vary from fairly light to very light champagne.